BEST Gluten Free Pancakes Recipe - with dairy free option! Gluten free pancakes are one of the easiest gluten free recipe to make and was the first thing I made after going gluten free. 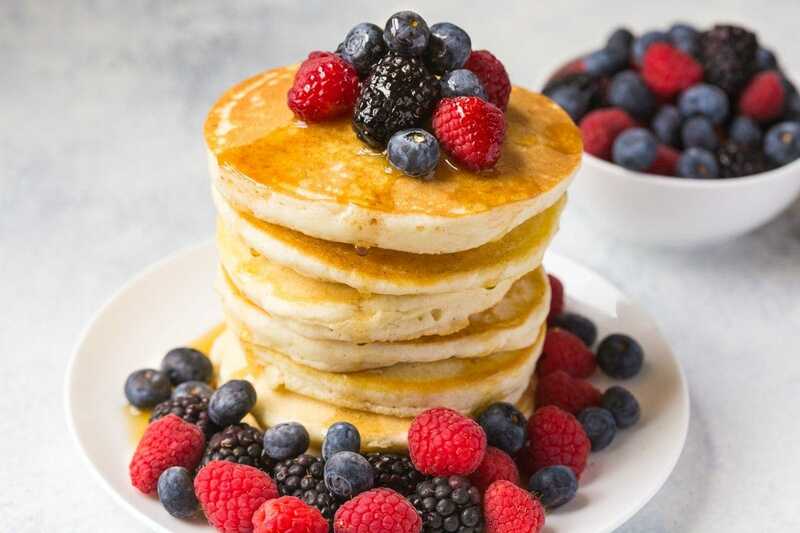 My recipe for fluffy gluten free pancakes is based on one that I have used for years at home, I’ve simply tweaked it to make sure that it works well as a gluten free recipe, we make it regularly at home. I eat dairy free so I used unsweetened soy milk to make these gluten free pancakes, but you can use whole milk if you are not dairy free. I always use a well seasoned cast iron skillet to make my pancakes, If you use a pan that is not non stick them you’re likely to be frustrated pretty quickly as they will probably stick when you try to turn them. Grease the pan just a little with small silicone brush in between every batch of pancakes to make them easier to turn, you don’t want them swimming in fat or you will end up frying your gluten free pancakes!If you are not dairy free then a little butter works well. 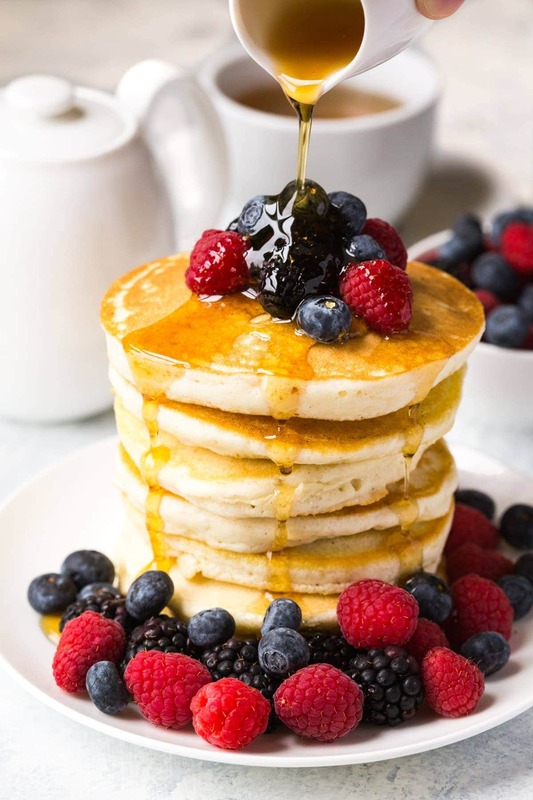 Don’t expect them to make air bubbles in quite the same way as regular pancakes, they will make some but it may not be as many as you are used to with regular pancakes. Make sure your baking powder is not old or your pancakes will not rise. I often measure out my dry ingredients ahead of time and put them into ziplock bags to create my own gluten free pancakes mix that is ready to go in the morning when the children are getting ready for school. 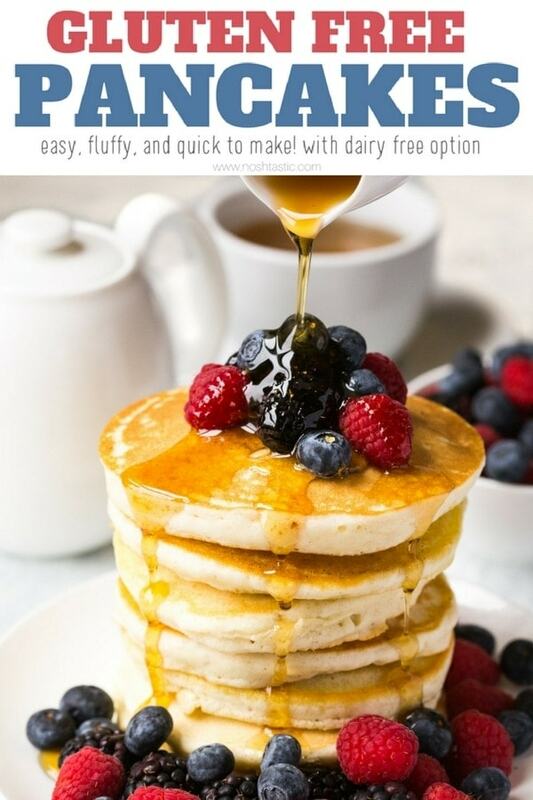 You can make the pancakes dairy free easily by using your favorite dairy free milk, I use unsweetened soy milk but other milks would work well too. Serve them warm from the pan! This is the best way to eat them. 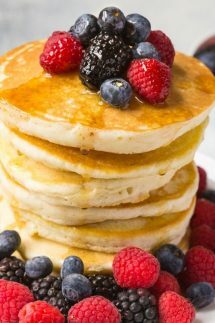 If you’re looking for more gluten free baking recipes I have a great recipe for Paleo Pancakes that are made with almond flour, they are super fluffy and taste fabulous! You also would enjoy my gluten free lemon bars, they are one of my more popular posts! I have a great recipe for gluten free waffles, they are also a popular breakfast recipe around here. An quick and easy gluten free pancakes recipe that is far superior to any boxed mixes you've tried. Watch the Recipe video, it's just after the directions. Don't miss the recipe video, it's right after the directions! Heat your skillet to medium high heat. Add all your dry ingredients to your mixing bowl, stir well. Add the milk and mix with the egg and then add to flour. The mixture should be a dropping consistency, you may need to add a little more milk to get it just right. grease the skillet a little, then drop on spoonfuls of batter. if they are too pale on the underside you may need to raise the heat a little. Check the skillet each time to see if it needs regreased so the pancakes don't stick. I bake by weight as I find that gives the most consistent results, especially when baking gluten free. One cup of your gluten free flour blend may not weigh the same as my blend, all the commercially available blends have different mixes and ratios of flour in them. I’ve weighed cups of different blends of flour and noted that a cup of gluten free flour can vary in weight from 125g up to as much as 170g depending on how you scoop it, and what type of mix you use. You can see how this could drastically alter the outcome of a recipe. I prefer to use my own gluten free flour mix as it's cheaper and I get really great results. If you can, avoid buying flour with gums already added. The reason for this is that you have no way of knowing how much gum is in there and that can alter the outcome of the recipe. I was always curious how to make gluten free pancakes. One of my best friends is gluten free, this will be perfect for her! Timing is perfect too, her entire family is coming to stay next weekend! I also love that you can make this with soy milk – useful to know! My 13 yr. old has some gluten sensitivities and we are currently working on removing all gluten from his diet – do you have a specific brand of gluten free flour that you recommend?? 🙂 I know he would love to have “regular” pancakes! Gotta love pancakes! A weekend staple for me! You’re absolutely right Sheena! Who doesn’t love pancakes? Those images just make me want to jump into my computer right now. Well done! These look delicious! I do have to admit that I use a GF mix most of the time I make pancakes, but I have made some GF oatmeal pancakes from scratch that are quite tasty. Will definitely have to try your recipe-thanks for sharing! These have to be the most gorgeous gluten free pancakes ever! I can’t even stand it 🙂 And I love how few ingredients they have. Perfection! If these pancakes taste as good as they look, they must be amazing! What great pictures. Pinned. I am curious what all purpose flour you use to make your gluten free pancakes? I find results vary widely with different mixes, and these look like something I would love to recreate! Tessa, I generally tend to mix my own as it works better and is cheaper, I rarely use pre-made ap flour. I mix up about 70% starch flours (mostly white rice with other starches added in) and 30% whole grain such as brown rice flour and sorghum. Beautiful stack of gluten free pancakes, Sheena! ♥ I find most store mixes are full of junky things… and homemade is always better anyhow. You’re so right! I’ve never found a store mix I like. This would be a beautiful breakfast or even a snack! Either way, I would love to eat it! The syrup and berries make your gluten free pancakes even more beautiful! I can’t take my eyes off it. Delicious! Sheena, I’ve had Celiac for 43 years!!! When diagnosed, there was nothing on the market, no one even knew what Celiac Disease was, and even when I explained they seemed to remain confused. Until the day my Father died, 22 years ago, he would always ask me if I wanted a biscuit?! Didn’t mean to write so much, I wanted you and the others to know the only Mix I have found in all my years, is “Cause You’re Special”. I have to order it from them, I’ve never seen it in stores, but I love it, and I do use Buttermilk in the mix. My Mother can’t tell the difference she says, and that’s rare, because she has always been an excellent cook and baker, and never thinks my GF is as good as hers. Hi Cathy! I can’t even imagine how hard it must have been 42 years ago to start to deal with Celiac, I guess we’re well off for GF food today compared to back then!